CASE motor graders are built with a powerful engine, rugged A-frame and moldboard design, industry-leading flip-up rear hood, best-in-class serviceability and outstanding visibility. They’ll make you more productive on the toughest jobs and longest days. From a unique moldboard design that rolls a superior mix to a fuel-effi cient, turbocharged Tier 3 engine that achieves operating speeds of up to 43 km/h to a spacious, rear-mounted cab that gives operators exceptional visibility of the working components of the machine. For even higher performance the Dual Power maximizes operation at higher speed thanks to the double (845B/885B) or triple (865B) engine curve flattening from 4th gear. The reinforced involuted moldboard improves the blade life thanks to different radius. The CASE radius design consists of three different radius allowing a more efficient and continuos cutting, mixing and rolling. The mixing effect is efficient on the spread out material too. This improves road surface consistency and longevity. The durable front A-frame drawbar and high-strength circle provide outstanding stability. The A-frame drawbar has a heavy duty boxed frame design supporting the circle with a wide stance. It has increased the life of the circle and the drawbar components. CASE motor graders are designed with external circle teeth. The external teeth are easier to clean and provide a larger contact area to avoid components wear and for a greater leverage when turning the blade under load. This means there is no need for slip clutches or shear pins, which normally require repositioning or repair. This option protects your circle turn components. It acts as a shock absorber and allows the moldboard overpass obstructions and then return to its original position. This works automatically. No adjustment or operator intervention is required. The rear-mounted cab of B Series motor graders, combined with floor-to-ceiling glazed windows give operators a superior visibility of breakaway side mirrors, moldboard, circle, saddle and tires. Even rearward, the sleek, sloping hood provide excellent visibility when backing up. The Isomount cab reduces noise and vibration, and consequently operator fatigue. Couple that with a deluxe suspension seat with lumbar control and any operator will be not only comfortable, but more productive. The sloping rear hood, breakaway heavy-duty side mirrors, and floor to ceiling glass with defrost rear window allow for outstanding visibility to the rear and to the front. CASE™ industry exclusive visibility on front articulation design allows the cab mounting to be further back on the machine. With front articulation the operator maintains a centered position while the gooseneck is articulated. This design increases visibility to the moldboard, circle, saddle, and tires. The front articulation gives the operator the possibility to see simultaneously the rear and the front half of the machine without the operator having to look to the side while the machine is articulated. In addition, front articulation allows for a tight turning radius, which is ideal for cul-de-sacs and tight job sites. When you invest in CASE equipment, you look for duration. We make it simple. 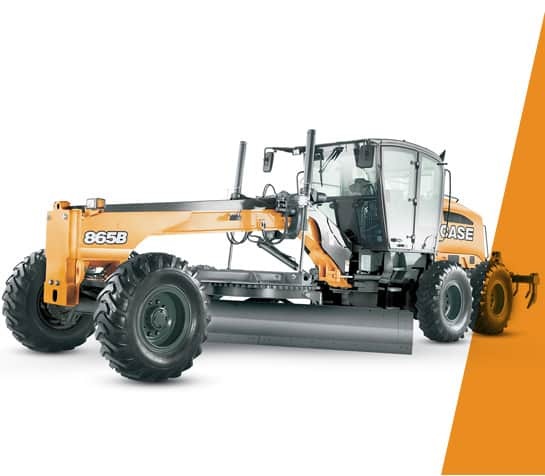 CASE B Series motor graders are no exception. From a one-piece, fl ip-up hood and a reversible fan option that blows out cooler debris to ground-level site gauges and service points, you can do daily maintenance in a matter of minutes. It’s the easiest way to help you get the effective performance and longest life out of your machine. The daily maintenance of each CASE grader model can be managed without the use of any specific tools. All the hoods can be easily removed or lifted without any effort making visible and reacheable all the vital components of the machine. The grader refilling can be done directly from the ground and the large tanks capacity allows to work for the whole day without stopping.